Today on PGL we woke up and we were very excited for that day. First we had breakfast then we got in our groups and went off to our activities. Miss Banks and Miss Harrison’s group went off to the high ropes which they found very fun. At first is was very scary for their group but at the end they loved it. After that they made their way over to the zipwire and they all got harnessed up. The zipwire was really fun but the high ropes just about beat it. Then we had lunch and it was really nice we had some chicken and vegetables. After lunch we were ready for surfing. We got on the coach in our wetsuits. After that, we got our surfboards and walked to the the beach. The beach was called Westward Ho! 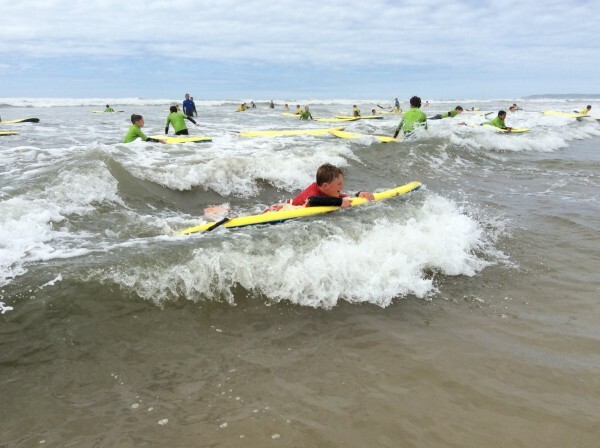 The teacher told us what to do and then we got to surf. Surfing was really fun and the waves were massive. We kept falling off our surfboards but some people were amazing. Then we came back to Beam house and we had some dinner. After that it was time for the evening activity. In about ten minutes we are going to play some games… so far we have had a really good day!